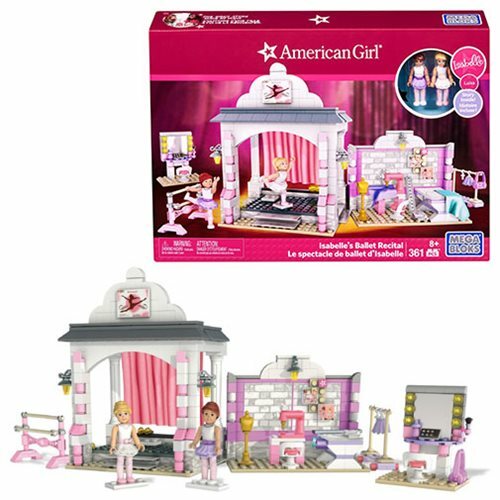 Shopping for American Girl Playsets? It's time to draw back the curtain on the Mega Bloks American Girl Isabelle's Ballet Recital Playset and put on the perfect performance! Help her get started by building the dress rehearsal area where Isabelle can design and create costumes at her buildable sewing station! Next it's time to build the ballet bar, where she and her friend Luisa can practice their moves! Now that they're ready to perform, build center stage and have the girls perform a dazzling dance duet! The stage also features a spinning floor so that you can display all of the girl's polished positions and poses! Ages 8 and up.